Note: A very respectable member at www.psphacks.com/forums pointed out that if you short out the battery or cause it to overheat there is a risk of explosion, so If you must use this method please, be careful. I AM NOT responsible for any damage to batteries or persons when using this method, I suggest buying a Tool Battery. As you can see from the pictures the pin on my battery is allready removed. Use anything you want to remove the pin from your battery. I used a sharp knife and gently cut the pin off. BUT REMMEMBER if you touch two of the pins at the same time, or slip and close the circuit between anything metal (ie. have the tool your using, such as a metal knife, touch two different parts at the same time) you could run a chance of ruining your battery. When you get the pin removed put your battery back together. Use a peice of clear tape around the edges to hold your battery together. 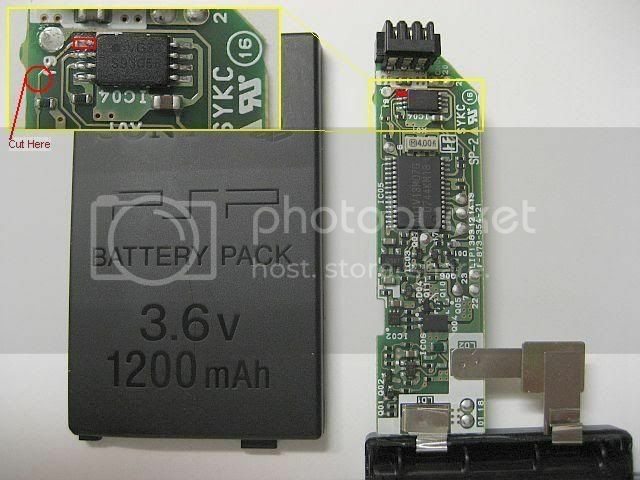 Dont use to much tape or the battery will kinda not fit properly into your PSP anymore, you'll have to push it in a little more than you did before. Thanks, but only the first three pics are mine and there prob the worst . The rest are from other peeps, their listed, too. If anyone has pics from hard mods of other types/brands of batteries I post em with their permission. I wanna get just about every battery type/brand in here that I can. And now it powers up but the screen won't show me anything. I don't think I even got to cut it. Sounds like you did it right, so right when you insert the battery the light, lights up immediately with a black screen? ? If it does that, then you did it right. Once you have CFW you can do almost anything, you can play UMD backups, PSX games, Emulators, plugins and much much more. So wait, I put it on my memory card and put it in the PSP? Did you make the MMS yet? if you did. So it's backing up my memory card and formatting it now lol. But isn't pandora or is it the magic stick (lol xD) that makes it hold more? Pandora is the battery and the MMS.